Not comedy about sports, but comedy played as a sport! Finally, a fun, fast-paced comedy show that's great for the whole family. 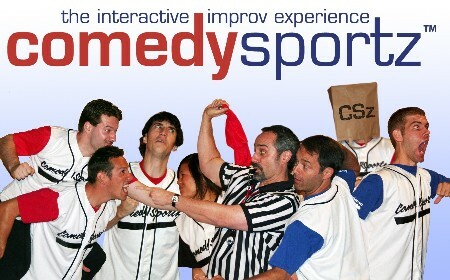 It's ComedySportz, an award-winning interactive comedy show where two teams of "act-letes" compete for audience laughs and points while improvising scenes, games, operas and musicals based on audience suggestions. A referee calls fouls and keeps the match moving at a blistering pace. The audience is always a part of the interactive show, voting for the winners and sometimes even winding up on stage! We even play the national anthem before each match. It's clean, fast and fun for all audiences. San Jose's longest-running show, we've been named Editor's Choice by The Wave Magazine and Best Local Theatre by The Metro's Best of the Silicon Valley.